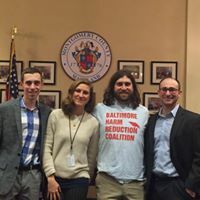 The Baltimore Harm Reduction Coalition (BHRC) is a diverse group of Baltimore community members and public health professionals dedicated to harm reduction. Harm Reduction is a set of evidence-based, practical solutions to real-world issues such as drug use, lifestyle choice, and sexual preference. On January 18th, the BHRC along with our colleagues at Drug Policy Alliance visited the Maryland House of Delegates and provided Overdose Education and Naloxone Distribution (OEND) training sessions to nearly 60 people including a dozen state delegates. This special event resulted in the BHRC’s 2,000th citizen to undergo OEND training and brought state-wide attention to successful harm reduction strategy to combat the ongoing opioid epidemic. We at the BHRC are proud to partner with The National Cannabis Festival and thankful for the opportunity to provide education and outreach to festival-goers. Progressive marijuana policy is a perfect example of harm reduction in action and reduces the criminal, social, and health-related consequences of drug use. We applaud the National Cannabis Festival for their efforts and look forward to partnering with them to raise awareness of harm reduction approaches at the country-wide level.